If you have high deductible insurance, this is an affordable way to keep on track with weight loss & improve overall health! Fifth Week Appointment: Weigh-in, Body Fat Analysis, and BioPhotonic Antioxidant Scan. Please note that the above services would amount to $180. This is a $131 savings! The winner will receive a $200 Gift Certificate which can be used for any wellness services at Healthy Weighs Wellness Center including: Nutrition Counseling, Functional Medicine, Chiropractic, Meridian Autonomic Testing (MAT), Massage Therapy, Acupuncture, Human Performance Programs, Facial Rejuvenation, Personal Training, Spa Services, Yoga, Medical Reiki/Reiki, Energy Medicine, Hypnosis and Guided Imagery. To win the contest, you must have the greatest loss of body fat as a percentage of your weight, as well as an increase in your BioPhotonic Antioxidant Scan score. If you lose the most weight, yet your scan decreases, you are not eligible to win the Grand Prize. OPTAVIA works because it’s simple and easy to follow. The Optimal Weight 5 & 1 Plan® jumpstarts your optimal weight journey. Five of your daily meals are OPTAVIA Fuelings. You’ll choose from more than 60 delicious, convenient, nutritionally interchangeable, scientifically-designed Fuelings. Your body will enter a gentle, but efficient fat-burning state, essential for losing weight. Each Fueling contains high-quality protein which helps retain lean muscle mass and probiotic cultures, which help support digestive health as part of a balanced diet and healthy lifestyle. The proven plans and products were developed by physicians, dietitians, and scientists and have been used by more than one million clients and recommended by more than 20,000 doctors since their founding. In addition to five Fuelings per day eaten every 2 to 3 hours, you’ll learn another healthy habit, how to make a Lean & Green meal for you and your family. When you know what optimal nutrition looks like, healthy eating becomes second nature. Please note that you do not have to be a patient at our wellness center to go on the OPTAVIA program. We ask that we place your first food order and guide you through the process for optimal success. This is a great solution for someone who cannot see us in our practice because insurance does not cover our services, but they really want to lose weight. More information can be found at www.healthyweighs.optavia.com or call us at 203-775-1819! 1. Toss chopped strawberries and sugar together in a medium saucepan. Allow to sit for at least 10 minutes, until juice begins to form in the pot. Turn heat on to medium-high, and cook until strawberries soften, and the juice begins to reduce, about 5-7 minutes. Puree with an immersion blender, or transfer to a blender to puree. 2. While you’re waiting for the strawberries to cook, whisk together the egg yolks, cornstarch, and salt in a medium bowl. The mixture will be a very thick paste. Set aside. 3. Return pureed strawberries to the saucepan, and turn heat to medium. Slowly stir in the milk. Cook until the mixture is hot and steaming. Very slowly add ½ cup of the hot strawberry mixture to the egg yolk mixture, whisking constantly. When it’s smooth, add another ½ cup of the strawberry mixture, whisking until smooth. Add the egg yolk mixture to the saucepan with the remaining strawberry mixture and cook over medium heat until the pudding begins to simmer and thickens, about 3-5 minutes. Remove from heat and stir in vanilla. 4. Transfer the pudding to an airtight container and directly cover the surface with plastic wrap (to avoid a skin from forming). Chill the pudding for at least 4 hours. 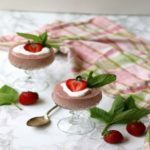 Serve in individual bowls, topped with whipped cream if desired, and garnish with sliced strawberries and basil or mint sprigs. 1. 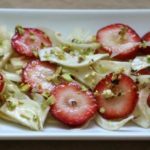 In a medium-sized bowl, combine fennel and strawberries. 2. Whisk together the olive oil, orange juice, and salt into a vinaigrette dressing. Pour desired amount of dressing over fennel and strawberries. Toss until evenly coated. 3. Sprinkle pistachios over fennel mixture and serve. CBD Oil helps relieve pain and reduce anxiety and depression. Best of all, it is not a medication and does not contain THC. We offer a variety of delivery systems to meet the varying needs of our patients: CBD oil drops, softgels, capsules, sprays, gummies and extra strength balms. Most of our line is the fastest acting, most concentrated CBD oil for critical and high intensity support. Because every person utilizes phytocannabinoids differently, each experience will be personal and unique. We also offer lower strength CBD products for more gentle support. We invite you to come and experience our product line and let us help you choose what is most appropriate for your concerns. 2. Plant your own produce! Designate a space in your yard to grow fresh fruits and vegetables, so you always have plenty of phytonutrients in your diet. 3. Get some Vitamin D! There’s no better time to be outside than springtime. It’s not too hot or too cold. Go for a walk, shoot some hoops, bring the kids to the park – just get moving. Sun exposure is a natural way to increase the level of Vitamin D in your body, which helps you absorb calcium better. If you’re fair-skinned and wear sunscreen, be sure to look at our full line of excellent Vitamin D supplements from Nordic Naturals and Standard Process to help improve your Vitamin D status. If you haven’t had your Vitamin D level checked, we suggest that you have it done with us or your primary physician. 4. Dust off the grill! Grilling is a great, healthy cooking method if you don’t char your food. Throw a combination of lean protein and vegetables on the grill to make kabobs. You can also grill fruit that is in season, such as pineapple or mango, and pair it with cottage cheese or plain Greek yogurt for a healthy snack. 6. This is also a great time to do a Spring Facial with Cynthia Buczek, our Licensed Cosmetologist. Dry, dead winter skin needs help. Cynthia can renew and refresh your skin with an O2 Lift Facial. Good for all skin types. Check out her facial spring special for this month in the attached flyer! 7. Pack a picnic lunch and eat outside! Try a grilled chicken cutlet on ½ whole grain pita pocket with lettuce, tomato, sprouts, and 2 tablespoons of avocado. Add a fresh, colorful fruit salad on the side. Be sure to include calorie-free beverages, like bottled spring water or sparkling water, to stay hydrated. Pack all your food in BPA-free, reusable containers and recycle the water bottles to help the environment too. 8. It’s important to get started with good sleeping habits. You need to stick to a schedule by waking up and going to bed the same time every day, including the weekend. Create a bedtime ritual. Pay attention to what you eat and drink before going to bed. Don’t have any caffeine close to bedtime or go to bed with a full stomach. Your bedroom should be your sanctuary. Declutter your room for tranquility! 9. Stress can be very harmful to your health! Destress yourself by scheduling an appointment with one of our Massage Therapists, Dorothyann or Greg. For new clients, they both offer a discount on the first appointment. They also have discounted packages. Allow yourself to take some time this month to restore and find balance with a Healing Energy Session! Make an appointment with our Medical Reiki Master, Pam Picard or Reiki Master Teacher, Dawn Enriquez. Take advantage of Pam & Dawn’s April Special which is $10 off any of our Healing Energy Sessions. We invite you to attend one of our relaxation meditation classes. We suggest you call to reserve your spot! The number to Healthy Weighs Wellness Center is 203-775-1819.